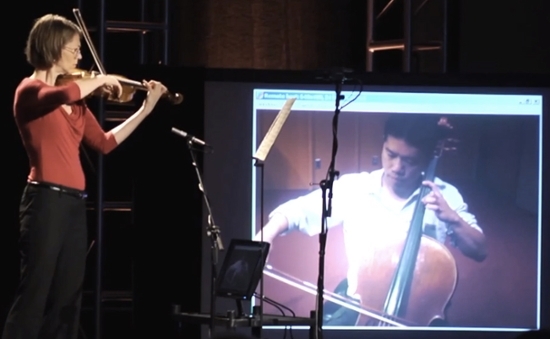 Overcoming the problems of distance, Internet2 and LoLa technology have set a new standard in video conferencing, allowing broader access to high-level musical and educational opportunities. A hush falls as the violinist takes the stage. She exchanges a glance with her cellist and then they begin. Four minutes later, the crowd leaps to their feet, roaring and applauding their appreciation as the virtuosos end in triumph. The musicians share a smile, bow to the crowd, and quickly stroll out of view. The violinist has a class to teach, so she jumps on her bike and sails off into the warm Philadelphia morning air. The cellist has a flight to catch, so he trudges out into a Dekalb late spring snow shower to hail a taxi. Wait a minute! How is it that the violinist is in Philadelphia and the cellist is in Dekalb, and yet they just wowed an audience with their intimate collaboration? Low Latency audio and video conferencing (LoLa) made it possible. With the highest quality audio and the lowest latency (delay) LoLa sets a new standard in teleconferencing. Developed by musicians for musicians, LoLa “makes life easier because it overcomes the problems of distance,” says Claudio Allocchio, senior technical officer at GARR, the Italian Academic and Research Network. Allocchio and a team from the Tartini Music Conservatory in Trieste are the creators of the conferencing technology. Collaboration is an art form. Internet2 and LoLa make it possible at a distance. Left to right: Marjorie Bagley, associate professor of violin, University of North Carolina, Greensboro; Cheng-Hou Lee, assistant professor of cello, Northern Illinois University. Courtesy Internet2. A typical LoLa setup includes a microphone, a camera, and a video screen. LoLa offers clear video at up to 90 frames per second, but since sound is most important for musicians and music educators, audio is where LoLa shows its quality. With LoLa, the audio stream remains uncompressed – so a student, teacher, or collaborating musician hears raw, recording studio-quality, full-spectrum audio at a sampling rate better than a compact disc's. Since the audio is excellent and authentic, educators can accurately model and correct timbre and technique from a distance. “When you are working on different aspects of tone and how things sound with students, if the true aspects of the sound are obscured by poor technology, the teacher's not going to be able to help you,” says Paul Bauer, interim dean of the College of Visual and Performing Arts at Northern Illinois University (US). Great sound is crucial, but so is timing. Each millisecond delay is like moving one foot away from your collaborator. Research indicates musicians need less than 30 milliseconds (ms) delay to comfortably play together — LoLa offers latency around 5ms. If you want to sing while a student is playing, or feel if a rhythmic groove is about to fall apart, low latency is a must. “Being a good musician is being able to react and interact to other musicians. So if you can reduce the latency down to a certain level, it becomes a more natural performing environment,” Bauer says. Latency is responsible for the awkward pause when a television anchor speaks to a correspondent at the scene. The anchor's question has to be encoded, transmitted, routed, switched, uploaded, decoded, and then broadcast to the correspondent — each step adding more and more delay. To achieve their technical feat, LoLa engineers use specialized audio and video devices (machine vision cameras, for example) and optimized software processed in parallel to tap the power of multi-core CPUs and GPUs. To ensure the lowest latency possible and remain free from error or jitter, LoLa technology relies on the data transmission capabilities found only through research and education (R&E) networks. “LoLa would not be possible without the Internet2 in the United States, and the work of national research and education networks around the world like GARR and GÉANT,” Bauer mentions. Building the national R&E network has been the mission of Internet2 from its inception, and they have a well-earned reputation for fostering collaboration among higher education institutions. “We believe the intersection of advanced networking and performing arts is central to Internet2's mission of enabling community-driven innovation, research, and education,” says Ann Doyle, manager of cultural initiatives at Internet2. LoLa's technical feat is impressive enough; even more impressive is the broader access the low price point brings to primary and secondary schools, universities, and other institutions able to handle the bandwidth. More than merely minimizing the cost associated with hosting world-class musicians, LoLa presents a solution to logistical barriers. For example, LoLa makes it possible for an elderly master musician to share her expertise without having to travel.